The Loves of Jenn: Hey bartender! She looks like she got into it but I assure you she did not! 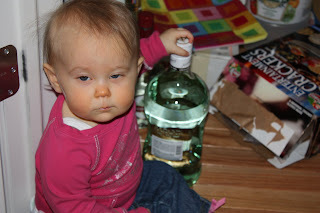 I like that last one where she looks like she could be a bit tipsy! So funny! Now I know why she sleeps so much!!! I'll always figure things out eventually!!! That bottom one is so hilarious!!! 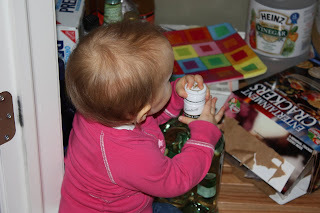 Sam is really into the vegetable oil bottle lately... kids are so funny. 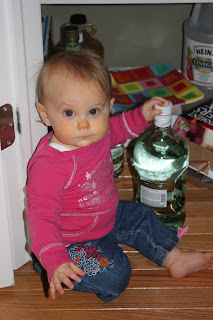 Think she be like her dad and pour me one?